Although the details of this ongoing story have yet to be fully revealed, it spotlights cultural stereotypes often associated with dining etiquette. While North Americans and Northern Europeans deem that transferring edibles to the mouth with a metal-pronged stick is somehow more refined than using the utensils we were born with, members of the many cultures who have been eating with their hands for thousands of years beg to differ. 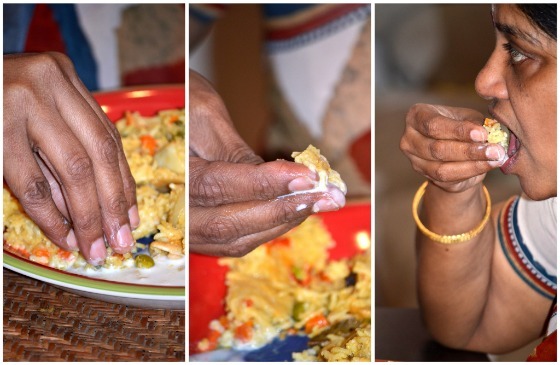 Africans, Arabs and Indians (to name only a few) describe in rhapsodic terms the advantages of eating with their fingers: the sensuous connection to the food, the feeling of sharing and community, practicality (in that it’s easier to pluck that last bit of meat off the bones) avoiding waste, even a lingering aroma on the fingers to sustain the memory of a marvelous meal. Significantly, all cultures that shun silverware maintain a set of rules for eating with the hands. Before the meal, the hands must be washed, wiped or even rubbed with sand, as desert Arabs do. But the foremost rule is that only the right hand is employed for eating. “The left hand is never used for that,” Jacinto says, “It is considered unclean.” In principle, at least, this is because the left hand is saved for bodily cleaning. Another taboo Jacinto cautions against is jutha, or double dipping your bread into a communal dish of food. Enough talk, I decide, it’s time for me to get some hands-on tutoring. Luckily, my request for cross-cultural dining instruction interests Mostafa Raiss El Fenni, owner of Berkeley’s Sahara Home Décor. He invites me to stay for lunch and we sit on intricately carved and painted chairs amid his stunning collection of Moroccan carpets, ottomans, embroidered textiles, brass lanterns, conical clay pots and delicate tea glasses. “Does each person take the piece of meat and bread onto their own plate?” I ask. Raiss-El-Fenni also hosts Moroccan parties in colorful Berber tents set up outside his shop. Parties range from mint tea and pastries to an all-out catered feast with live music and belly dancers. 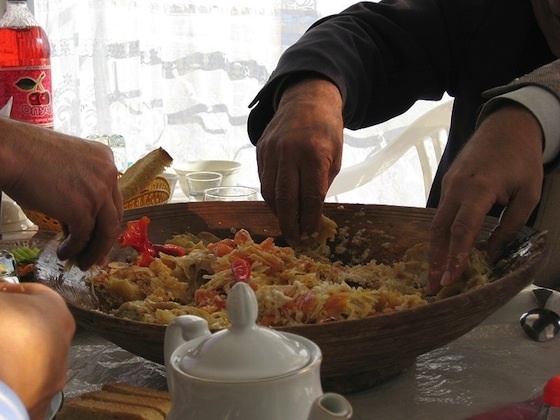 And of course, he will encourage your guests to eat with their hands for the true Moroccan experience. 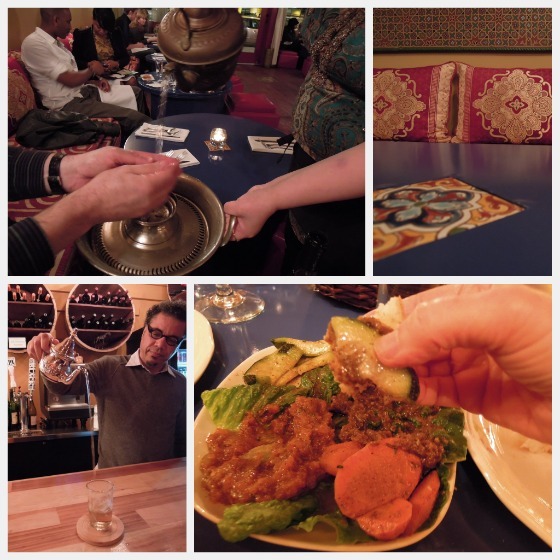 After my tasty lesson, I invite my husband out for a Moroccan meal and tell him I’ll show him how to eat with his hands, so we head over to Tanjia, an Oakland Moroccan restaurant we haven’t yet tried. We enter the lovely blue and red interior with low couches that let you sit close to your dining companion. But I am disappointed to see the tables set with forks and knives. When I tell the server we hoped to eat in Moroccan fashion, she gladly takes away the silverware and returns with a pot of water and washes our hands. The first course is an assortment of delicately spiced salads: carrots, eggplant, cucumbers, tomato and bell pepper. Easy to scoop up with chunks of home baked bread. But with the arrival of the lamb and eggplant and chicken with honey and prunes, which are so meltingly tender you can tell they have cooked slowly for hours, my husband chickens-out of the hands-on approach and, to keep him company, I ask for two forks. It’s not so easy to change a lifetimes's eating habits. Owner Jamal Zahid recently took over the restaurant from his brother, Said who started Tanjia in 2000. It has always been a “silverware optional restaurant” but seeing the reaction of a younger generation of customers not used to the traditional Moroccan way of dining sans utensils, Zahid decided-- as an act of hospitality to his guests-- to set the table with forks and knives, a reversal of his brother’s default setting. 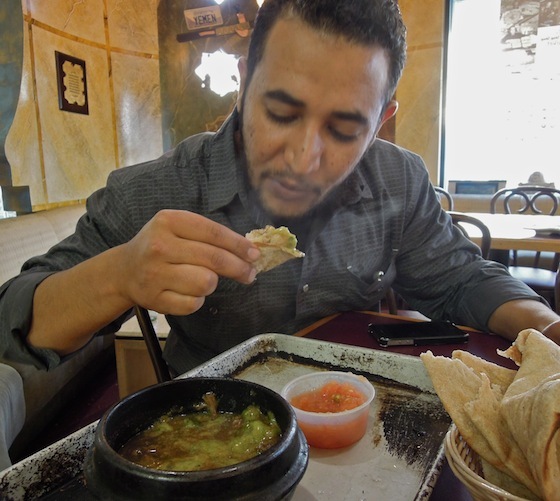 Personally, Zahid favors eating with the hands as a way to feel connected to the food and savor the meal slowly. 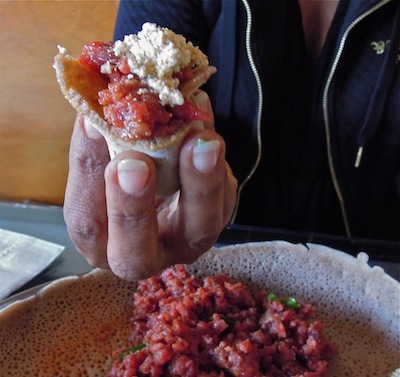 Tefferi demonstrates how to tear off a small square from the rolls of injera in the basket. 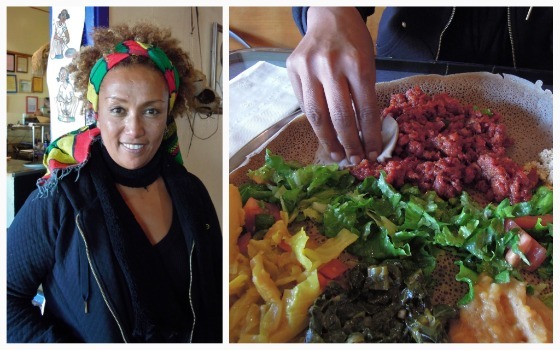 She describes the technique as “wrap and roll.” You lay your piece of injera over some food and use all your fingers to gather up the filling and twist it into a little packed pouch, which you may dip into several different dishes on the tray. 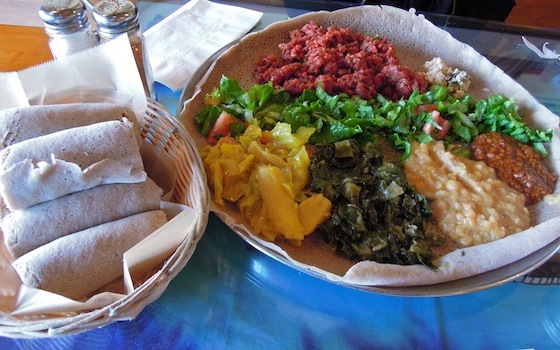 Our platter today has collard greens seasoned with black cumin, cabbage with carrots, potatoes with ginger, garlic and turmeric, lentils in red berbere sauce, yellow split peas in turmeric sauce, Ethiopian cheese and kitfo, a highly seasoned raw meat dish. “Children are taught to make a bite of food that’s just big enough to fit in their mouth all at once, without stuffing their cheeks and to eat only with their right hands.” Tefferi remembers her mother training her left-handed brother by having him sit with his left hand behind his back.